The Granville Golf Course was designed by renowned course architect Donald Ross. Donald Ross, with Pinehurst Number Two in North Carolina, Inverness in Ohio, Oakland Hills near Detroit, Seminole in Florida, and the Broadmoor in Colorado among his achievements, grew up in Scotland. Raised on golf at Royal Dornoch in the coastal town of Dornoch in northern Scotland, he began his professional learning at St. Andrews and continued at Dornoch before emigrating to the United States in 1899. 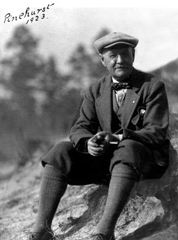 Ross developed quite a following in the states and became known nationally for his work at Pinehurst and other courses. Over the course of his distinguished career he designed all or part of over 400 courses. Over 100 U.S. national championships have been held on Donald Ross courses. In 1946 Ross founded the American Society of Golf Course Architects and was its first president. Donald Ross was brought to Granville by John Sutphin Jones. Jones, who made much of his money with the Sunday Creek Coal Company, constructed the Granville Inn, which opened in 1924. The Inn, constructed of sandstone quarried from Byrn Du remains today as a wonderful part of Granville. In order to make the Inn more competitive, Jones decided a golf course would be desirable. Wanting nothing but the best for his inn, he enlisted Donald Ross to be the architect for his course. The Granville course, regarded by Ross as one of his masterpieces, is known for many traditional Donald Ross features. Ross believed that the best courses were developed using the natural topography of the course to create a challanging variety of short angles and rolls. 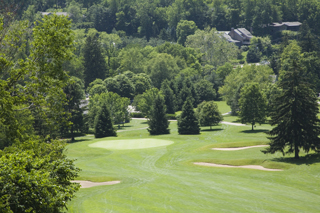 The Granville course, built as it is on the foothills of the Allegheny Mountains, is no exception. Perhaps its most dramatic hole is the eighteenth. From the tee on the Eighteenth, a good part of the village with its steeples can be seen. Denison, perched on the ridge north of the village, is readily visible with Swasey Chapel looking over the village. From the tee the land drops dramatically to the green in the distance. As with many Donald Ross holes, topping the ball at the Eighteenth will find one caught in a hazard, in this case the rough of a steep slope. An overly bold shot to the green will find another set of punishing slopes just past the hole. The green itself is classic Ross; protected by small but steep bunkers, it is an elevated undulating surface. Ross believed that courses should favor intellect and skill rather than mere strength. Granville reflects that goal with a course that is a challenge to both the average golfer as well as the seasoned professional. The Granville Golf Course remains one of the finest public courses in the United States. In order to preserve the open space provided by the course, Granville Township purchased the development rights to its land in 2015. In adedition, the Village of Granville acquired the area where the clubhouse and other buildings sit in order to control any development in that area. Thanks to the Donald Ross Society for its site www.donaldrosssociety.org and to Donald D. Bonar and Anthony J. Lisska for their fine work Scotland Comes to Granville – The Donald Ross Designed Granville Inn Golf Course, in Granville, Ohio, A Study in Continuity and Change, Volume II, Denison University Press. These resources were of invaluable assistance in preparing this article.